It’s Friendly Fill Ins time again. 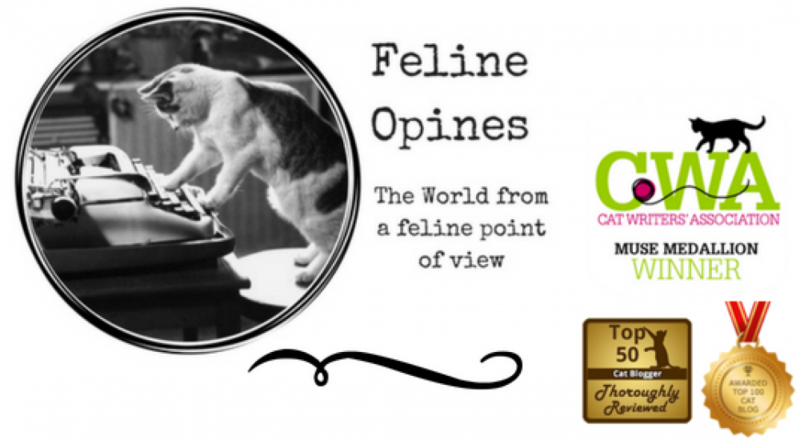 Don’t forget to head on over to 15andMeowing or Four-Legged Fur Ballsto join in the fun or you’re welcome to opine on your fill ins in our comment section. 1. My neighbors are very interesting forest creatures and I do all I can to reach out a paw of friendship to them. 2.The last thing I purchased online was nothing, I’m a cat, I can’t shop but I do enjoy when the humans order stuff. 3.I have never jumped on the dining room table while the humans were eating, but I do enjoy lounging there at other times. 4.Anything is possible if you believe it’s true. I am king of the jungle! This entry was posted in cat behavior, Cat blogs, Cat writers, cats, Pet blogging, shelter cats, Siamese cats, Top 50 Cat Bloggers and tagged Alberto, cats and birds, cats in boxes, cats on tables, Feline Opines, jungle cats, The Tribe of Five by Feline Opines. Bookmark the permalink. 1. My neighbors I’ve never met. The humans won’t let me go outside. 2. The last thing I purchased online was zilch. They won’t let me go on the computer either. 3. I have never been swimming. 4. Anything is possible if you meow plaintively enough. Except the going outside thing. Purrfect Fill Ins Mr. Lou! And I never thought about it but we don’t know our neighbors either…we’re all indoor kitties too. Oh and the best answer was your great advice about the meowing. This is a tactic more felines should employ! Meowza, one click shopping would work for us creatures without opposable thumbs and I Know my way around the iPad as I used to play a game on one when I was a kitten. Those were terrific! Hey, the last thing the Dad purchased online was a wireless mouse because Brother Simon deaded the one he had! Kitty kudos to Brother Simon, mouses of any type are our sworn enemies. MOL, I do know my way around an iPad, used one as a kitten to play games. But since I’ve become more mature I haven’t really been interested in it. I am thinking I should reconsider. I couldn’t agree more , humans must be managed very carefully ! You are one of the wisest friends I have. I completely forgot about Amazon and Chewy and another furiend suggested I have the Humans set up one click shopping. Just think of all the boxes!! 1. My neighbours: On the left there is his nemesis, Oscar the dog. And on the right there is Bert the dog’s family (but not Bert because he has since passed away, sadly). Not that this stops Catorze from making a nuisance of himself with Bert’s human family, screaming outside their door until one of them has to return him to us. 2. The last thing I purchased online: The little sod has everything he needs, so his transactions tend to involve donating money to less fortunate animals. 3. I have never: shied away from a cuddle with a man. Sa Majesté can, however, take or leave women. 4. Anything is possible if: You scream loudly enough. Great fill ins! I especially liked the one about you screaming at the neighbor’s house until they bring you home. You have them well trained! Yes, we know all about the lure of that dining room table that is supposed to be off-limits! And we can’t get enough boxes. Freddie and Frankie. It’s always great to meet like-minded felines! I always enjoy these more when the kitties fill them out. Excellent job, Alberto. Why thank you. We felines believe we are much more entertaining than the humans. Cute answers. Have a blessed week. Thank you,, wishing you a purrfect week as well.